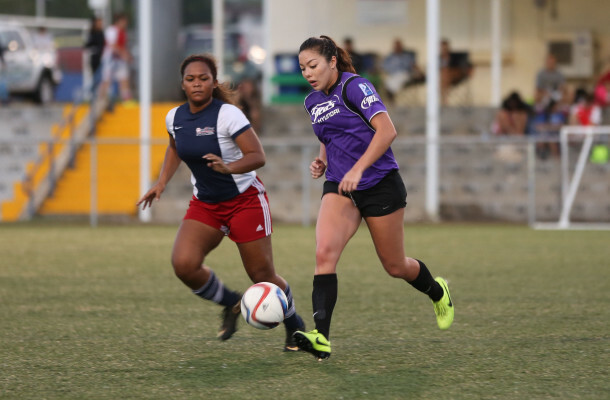 PRESS RELEASE – Three-time Women’s GFA Cup champions Personal Finance Center Lady Crushers had a close call on opening week of the 2016 Bud Light Women’s Soccer League Spring season Sunday at the Guam Football Association National Training Center. The Lady Crushers edged the Lady Rovers 3-2 in the second half to prevail 4-3 at the final whistle. The Lady Crushers’ Skyylerblu Johnson scored the team’s first goal off a header from a Colleen Naden corner kick in the first half and later, the eventual game winner in the contest in the 75th minute. Naden and Anjelica Perez also scored one each in the win. 14-year-old Brianne Leon Guerrero scored twice in her women’s league debut for the Lady Rovers and teammate Meagan Crisostomo also scored. 2015 Fall Season champions Quality Distributors had a rough start to begin the new season, falling to Hyundai 3-1. Erica Quichocho scored twice for Hyundai and teammate Arisa Recella also scored. Paris “Mames” Blas scored the lone goal for Quality. In the league’s other opening week match, the Isla Paint and Roofing Supply Lady Strykers defeated the Islanders 3-1. Alexy Dacanay and Christina Duenas scored in the 80th and 86th minute, respectively, to salvage a match that was leveled in the 64th minute on a Lady Strykers’ own goal. Yae Kawauchi scored the Lady Strykers’ first goal in the 12th minute of play. Southern Heat received a bye in the first week of play. Johnson, Leon Guerrero, and Quichocho currently lead the Golden Boot race with two goals each. The Women’s League takes a break for Valentine’s Day Sunday and will resume play Feb. 21 with the Lady Crushers taking on the Lady Strykers at 5 p.m. and Southern Heat playing against Quality, also at 5 p.m. Hyundai and the Islanders play the late match, kicking off at 7 p.m.